I have always been fascinated by Aussie Stockwhips. I just love their unique look. I’ve wanted to make one for a while now, but I’m often so busy I do not have time to experiment with new designs. A couple days ago I decided to invest some time in making an Australian stockwhip from nylon, just to see what I could do. In addition, my son Haddon has a birthday coming up and I figured a stockwhip would be a great present for him. After some trial and error -and losing several hours of sleep the night before last- the 4′ x 12 plait nylon stockwhip you see in the photos here was the result. For this whip, I started with a 5/8″ hardwood dowel because I don’t have any toheti cane. 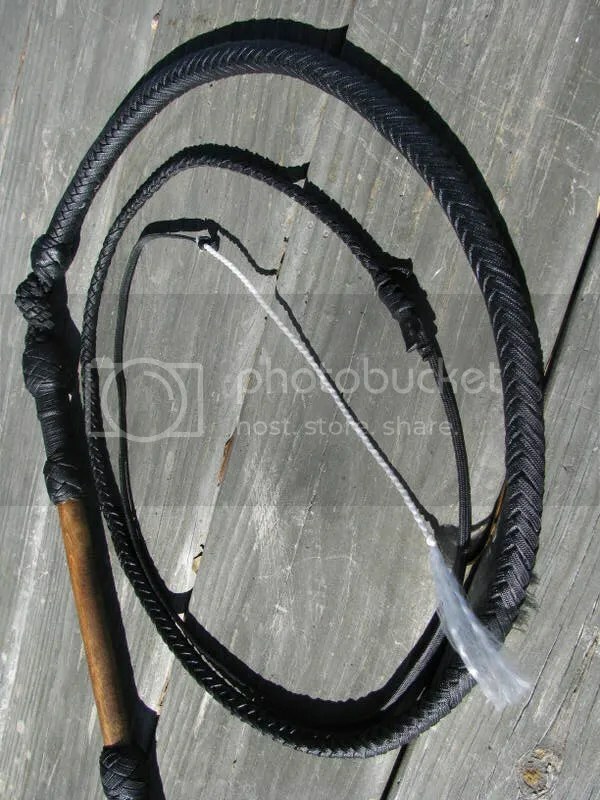 I used Ron Edwards’ book, How to Make Whips to see how to do some of the techniques that are required for making an Aussie Stockwhip. As you may be able to see in the photo, I used a more traditional hitch to connect the paracord fall to the thong. This gives the stockwhip a much more traditional look than had I ended the thong with my standard tapering twist. 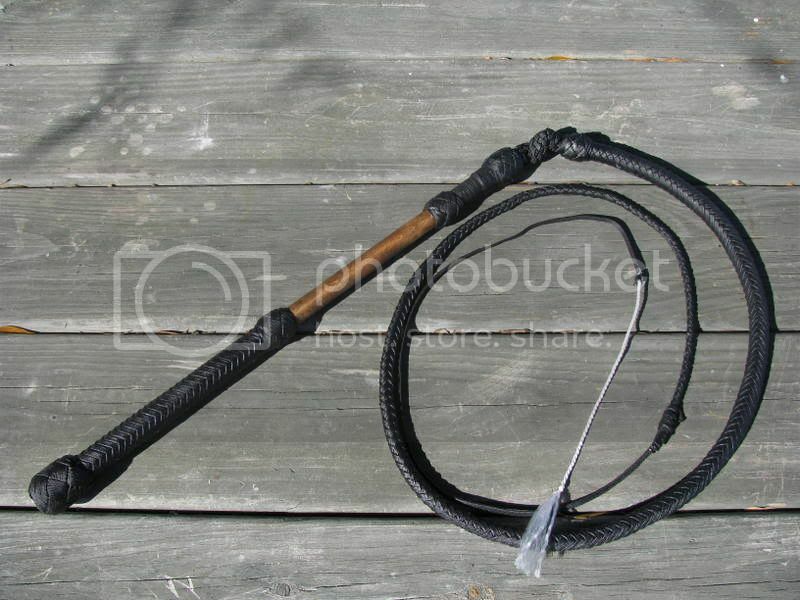 I may start offering this fall hitch as an option on my bullwhips and snakewhips as well. The keepers on this stockwhip are made of flat plaited nylon. Making the keepers was probably the most difficult part of the project. 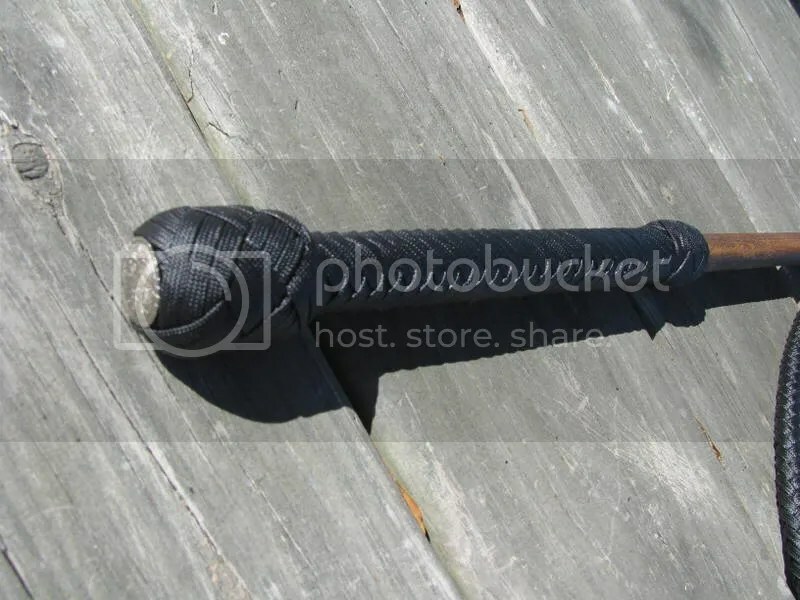 Making whips with this kind of thong/handle connection was all new territory for me. There are a few things I plan to do differently on future stockwhips I make, but I’m still pleased with the result here. The handle is 18″ and covered with a 12 plait in the traditional whipmaker’s plait. I think I spent more time on the handle (and its keeper) than on any other part of the project. I stuck a concho on the end of it to dress it up a little. How to get one: At this time, I have no plans to start selling these whips until I have worked on my design a little more. I am happy with this one and it will make a great gift for my son, but there’s still a few bugs I need to work out of it. Besides that, I’m still not sure what price I would charge to make one. Don’t despair though, if you attend the 2009 Whip Weekend in Oklahoma City, you will have a chance to get a new RK nylon stockwhip. I am planning to send one of my new stockwhips to that event to be given away as a prize. The OKC Whip Weekend will be held June 12,13 and 14th. If you have any questions or comments please direct them to me at rhettswhips @ yahoo dot com. This entry was posted on Friday, February 13th, 2009 at 9:32 am	and posted in Australian Stockwhip, nylon whips, Projects. You can follow any responses to this entry through the RSS 2.0 feed. im so excited it looks beautiful!!!! It looks great Rhett, I still think you should send one over here to Australia to let an Aussie try it out for you – To give you an Aussie opinion. Interesting looking project, sounds like you have it figured out.